Most of us like to pretend that the live-action adaptation of Super Mario Bros. didn't exist (understandably so). The entire production was a hot mess from poor direction, the creative team not being able to agree on anything, turning a children's video game into a dystopian setting ... it was just bad. Pair that with the cast not getting along with the directors made it even worse, the script constantly changing, and no clear direction ... well, it's easy to see why this project bombed hard. Cheech Marin: I turned down a few video games when they were first starting out. They wanted me to be this character and it turned out the character they were asking me to be was Mario of the Mario Bros.
Tommy Chong: What? Are you kidding? CM: No. It was because he had this mustache, ya know? TC: Holy ****! You could have been Mario? CM: Yeah, for real. They were going to give me a cut of the royalties and everything. TC: Oh my God! I didn’t know that. Who knows, maybe he could have sat everyone down, rolled a fat one, and gotten the team to get along. Or maybe the movie was just destined to fail. One thing is for certain; the absolute failure that was the Super Mario Bros. movie certainly set a negative tone for future adaptations. There seems to be a video game curse that all movie adaptations should fail. Sure there are a few exceptions that were mildly enjoyable but those are definitely the exception, not the rule. 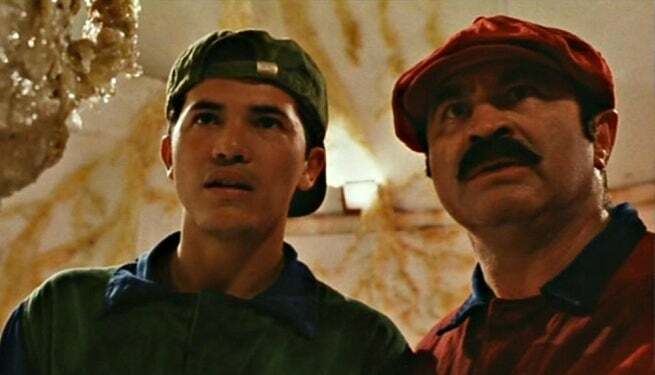 Now there's a new movie in the works featuring our beloved Mario brothers, but thankfully this one will be an animated version - not a weird dystopian live-action (phew! ).